At last, spring is in full force here in Atlanta. The flowers are blooming and the tree leaves are out with their lovely light green color so striking against the bright blue sky. 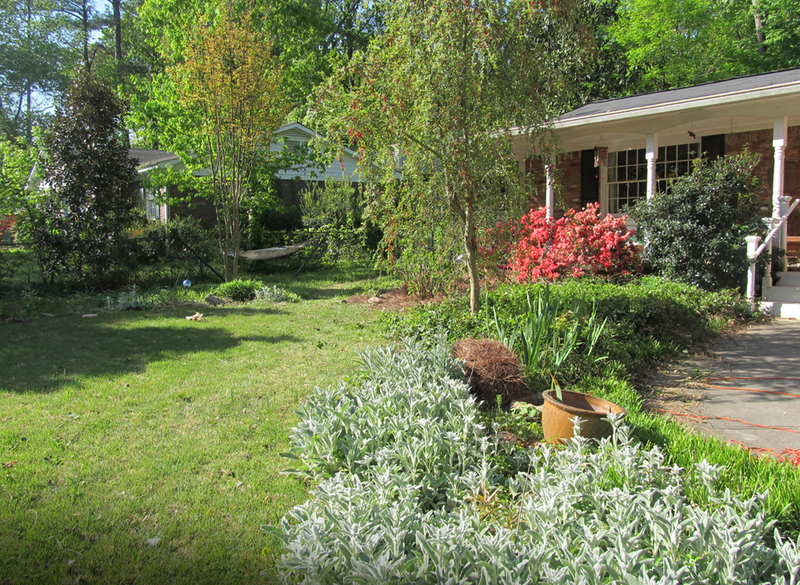 I have been spending the past week working in our yard; starting to tame all the overgrowth. Even though I have a degree in landscape architecture, I’ve never been much of a gardener. A few years ago we put in some large flower beds and planted a few smaller flowering and evergreen trees that now are helping to define our yard; but with no attention, the English ivy, poison ivy and blackberry brambles had taken over. I’m learning the lesson that with care early in the season, when the ground is moist and mosquitoes not out yet, gardening can actually be kind of fun. I’m planting perennials where the weeds were along with mulch hoping to encourage a lovely, easily maintained garden. 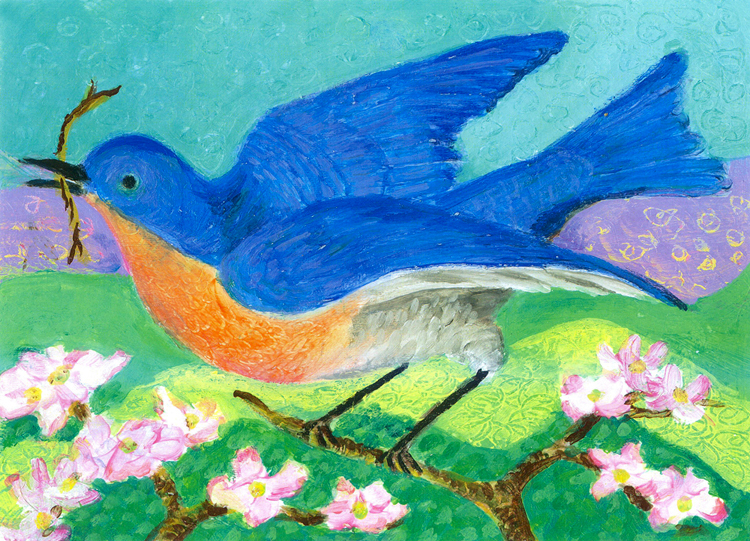 I painted Blue Bird in Spring last spring. It was fun to paint, I tried to make it look like an old vintage postcard symbolizing spring. On my walks I often see bluebirds flying about. 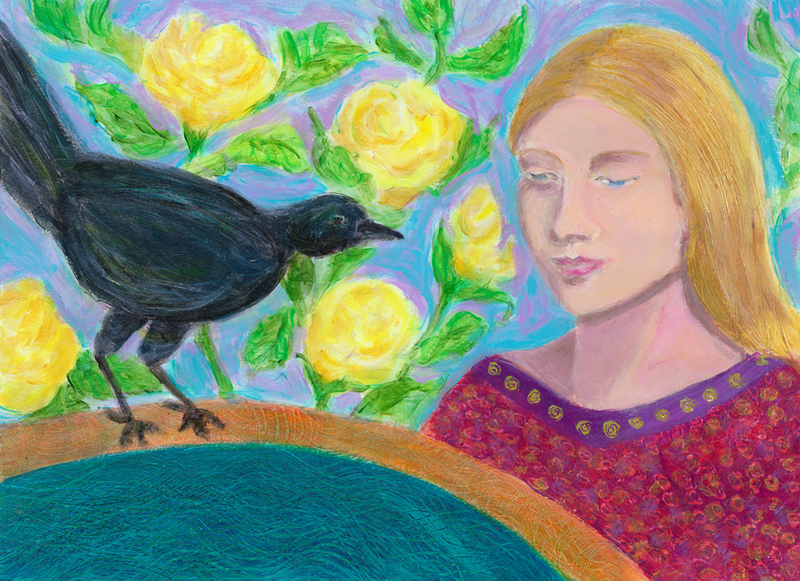 The bluebird symbolizes joy. When I was young the bluebirds had disappeared. People began to make an effort to bring them back by putting up bird houses in their yards and meadows. The bluebirds returned; it’s encouraging to realize how resilient nature is. I painted this bluebird to remind me of how joyful and resilient life can be!